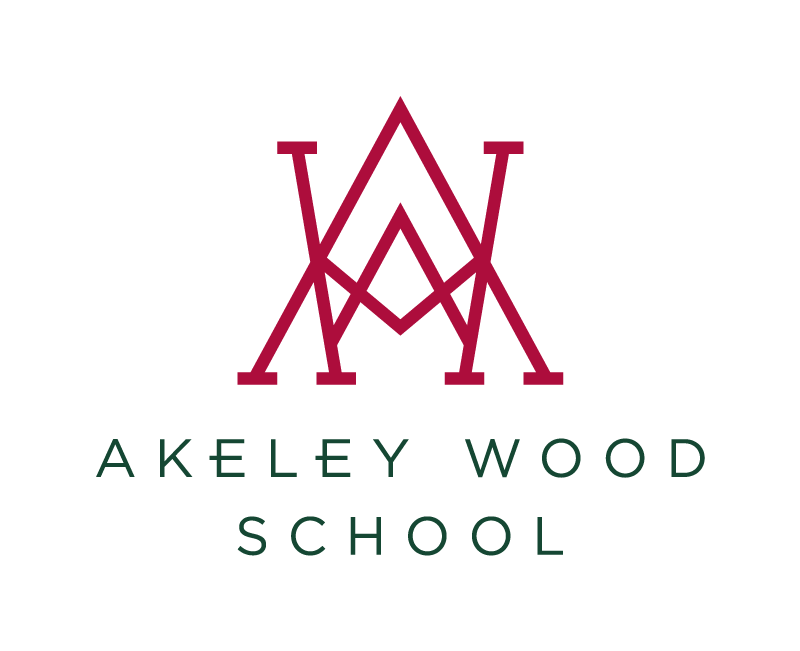 On the morning of Friday 8th July 2016, after almost a year of fundraising, Akeley Wood’s Project Volunteer Sri Lanka team 2016 finally headed to Birmingham airport, to make the long journey to Galle, in Southern Sri Lanka. 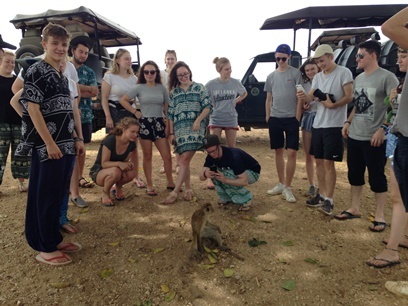 The project’s biggest team to date, a group of 21 students from year 12, accompanied teachers from the school. 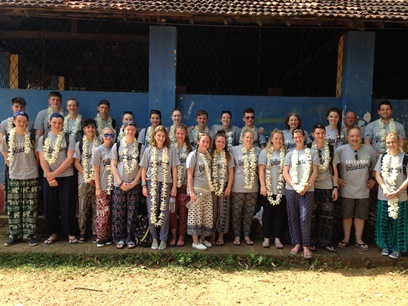 After a very long journey, the group arrived in Galle in time for a Saturday lunch (curry, rice and dhal) – and spent the rest of the weekend settling in to accommodation, chilling on the beach and adjusting to the environment… not least the heat and humidity! 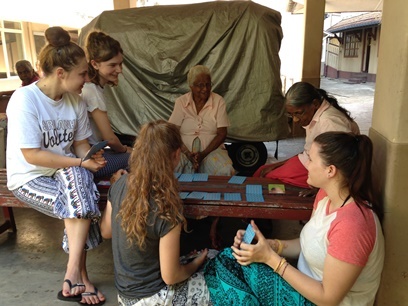 On Monday, work began early and in earnest, with various groups going to work in the elders’ home, community nursery, orphanage, girls’ home, and disabled class. The discussions at lunchtime, showed that, already, students were being challenged by the conditions and the cultural differences, but, equally, that they were rising to the challenges. In the afternoon, the group headed to the school to begin the two-week building challenge. 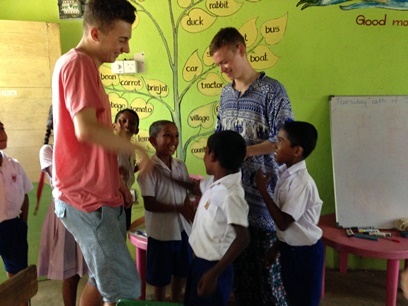 The enormity of the task dawned, a four-classroom block needed demolishing and rebricking, the floor breaking up and re-laying, window mesh wire-brushing and painting, walls painted inside and out – to create an English resources room and music class. In addition130 desks and chairs needed to be sanded down and repainted, in the main hall; and the science lab (benches, chairs and walls) needed to be repainted and varnished. For two days solid, a team of students moved tonnes of rubble in a broken wheelbarrow, across a bridge (constructed by lashing together some old planks) over a drainage ditch; for another two days, a team of five (rotating as they grew exhausted) sieved sand using a huge wooden sieve, until their hands blistered; another team sanded and painted for hours on end… often working late rather than leave a task unfinished for the next day. Through sheer determination and grit the task was finished, with time to paint a mural and plant some plants outside the English Resource room before the Thank you Ceremony! It was incredible! At the same time, we were desperate to get into the new Bakery School building (the down payment for which was provided by the team’s fundraising). So as not to take time out from the other projects, everyone agreed to spend the Full Moon holiday at the Bakery School house (which had been empty for three months prior to completion, so was showing signs of having been empty). The intention was to deep clean the entire building and paint it out, ready for the installation of the kitchen equipment and small dormitory upstairs. A crack team of brave souls took on the kitchen and scullery, where there was a greater abundance of wildlife, and the rest of the team scrubbed, swept and cleared the rest of the rooms, until everything was spick and span. 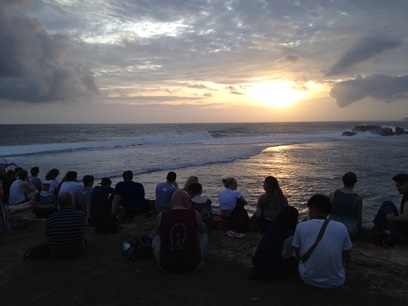 As with all these trips, there were highs and lows: stomach upsets, blisters, tears, laughter, friendships, heartaches, beautiful scenes, and less beautiful ones too. But this team embraced every challenge and, where individuals occasionally wobbled, for various reasons, the team ploughed on – supporting one another.